The notes for the course MAT-52606 Mathematical Cryptology at TUT Finlandia. They contain the central mathematical background needed for understanding modern data encryption methods, and introduce applications in cryptography and various protocols. Keijo Ruohonen wrote:These lecture notes were translated from the Finnish lecture notes for the TUT course "Matemaattinen kryptologia". The laborious bulk translation was taken care of by the students Jussi Kangas (visiting from the University of Tampere) and Paul Coughlan (visiting from the University of Dublin, Trinity College). I want to thank the translation team for their effort. 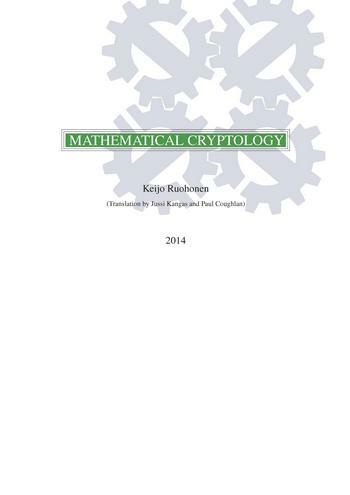 The notes form the base text for the course "MAT-52606 Mathematical Cryptology". They contain the central mathematical background needed for understanding modern data encryption methods, and introduce applications in cryptography and various protocols. Keijo Ruohonen is a retired professor of mathematics at Tiampereen Teknillinen Ylopisto. His main field of research is in computability theory, algorithmics and formal languages, lately especially in continuous-time computation and group-theoretic algorithms.